Installation view, ‘Anu Põder: Be Fragile! Be Brave!’, Kumu Art Museum, Tallinn, 2017. All photographs: Hedi Jaansoo. Courtesy Kumu Art Museum. Two arm-like shapes made from brown burlap slump on the floor. Their durable surface is covered in blush stains and splattered layers of black epoxy. The rope that holds these large limbs together appears as though it were loosened only a moment before. Anu Põder’s Composition with Strings (1983) describes the first exhalation after the trials of a long day. The resilient materials and precise weights of Põder’s sculptures communicate a female life that is heavy duty. Born shortly after the Soviet reoccupation of Estonia in 1944, Anu Põder (1947–2013) was an Estonian sculptor who made work across two discrete and contrasting periods in Eastern European history. During the 44-year occupation, Põder completed her studies at Tartu Art College in 1970 and the Estonian National Art Institute in 1976, before unexpectedly having to raise her three children by herself, living in a state-subsidized artist apartment in Tallinn. Estonia regained sovereignty in 1988 and independence via referendum in 1991, shifting Põder’s context from the hardships of the Soviet regime and its ideal of the hard-working, healthy woman and mother, to the glorifications of national identity and the concomitant commercializations of the female body and family spaces. The intention of ‘Anu Põder: Be Fragile! Be Brave!’ at Kumu Art Museum, Tallinn, is to place Põder in dialogue with other artists concerned with female experience, as to date Põder has mostly only been exhibited alongside her Estonian contemporaries, with whom she shared little or no conceptual or aesthetic commonality.1 Utilising textile and plastics, often in pale skin tones that turn from pink to deadened yellow, Põder expressed inner feelings through bodily mutations. 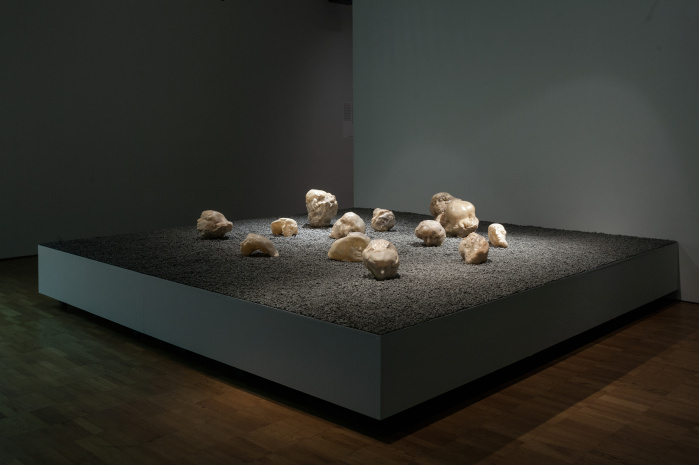 But, as one might expect, it is not artists such as Louise Bourgeois, Méret Oppenheim or Eva Hesse that this exhibition turns to for conceptual or formal resonances. For this solo-turned-group exhibition, Põder sits alongside Cuban-American artist Ana Mendieta (1948–85) and Polish sculptor Alina Szapocznikow (1926–73), and three contemporary artists: Austrian-born multimedia artist Ursula Mayer, Polish artist Iza Tarasewicz and Estonian artist Katrin Koskaru. The exhibition isn’t presented as a research-focused retrospective, compounding affinities through textual analysis and chronological ordering. Instead, what the exhibition’s curator, Rebeka Põldsam, along with a design team made up of Põder’s family, present is something far more alive and bodily, in which you are free to make your own connections and that allows each work its own ‘breath of life’.2 The large space of the exhibition hall with its many rooms seems to have been conceived of as a body itself, giving each of the included artists their own ‘limb’ that senses the world in its own way, all the while connected to the torso that contains Põder’s work. Installation view, ‘Anu Põder: Be Fragile! Be Brave!’, Kumu Art Museum, Tallinn, 2017. Courtesy Kumu Art Museum. Shown in the main exhibition room, Composition with Strings is one of fourteen sculptures from the 1980s and 1990s grouped together on a single platform. Speaking about this transitional period, Põder has said: ‘The 1980s – this period was closed and full of anguish. It was as if you didn’t know anything, didn’t see anything, didn’t understand anything. It was like a closed society. My first pieces were really expressive, it was as if they were twitching – perhaps it was also a really difficult and confused period in my life.’3 The singleness of each work in this grouping speaks to Põder’s experience: the feeling of being alone, facing numerous emotional and physical challenges. 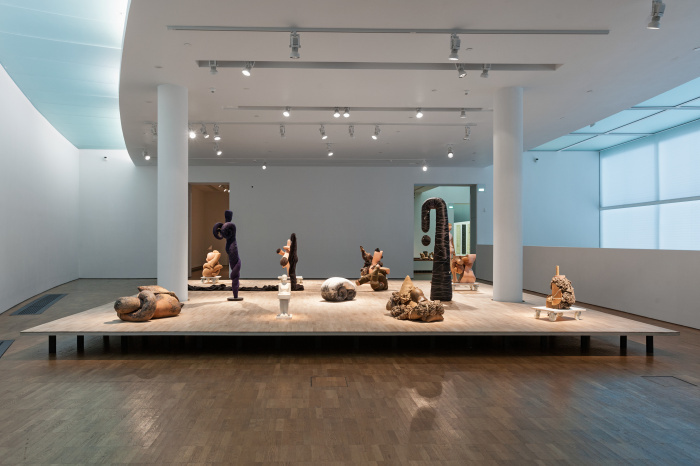 Each sculpture articulates a prosaic feeling: one that has risen suddenly amongst mundane activities, and is so nuanced and fleeting that it is difficult to express in words. In Long Bag (1994), a figure made from darkly-coloured textile stands with her feet planted and arms splayed back, as if gathering force. The positioning of her fingers acutely conveys the twitch of adrenaline prior to an attack. The enlargement and shrinking of bodily forms is regularly performed in Põder’s practice. Here a female figure shrunk to three-foot tall conjures a wall of the same material from which she is made up through her body; it also surges from her feet across the floor, some five-feet in front of her. This is the frustration of feeling unseen and voiceless, in which unified textile represents a gathering of energy that amplifies the body in a silent rage. Physical and mental strength, and the particular toughness required in a female life, also play out in these works. In Figure which was Made to Walk (1984), a female figure takes an automaton-like step forward. Pale flesh-tone plastic is stitched over dense layers of grey, brown and yellow epoxy, forming a shell-like skin, broken open in places seemingly through wear and tear. The figure’s only function is to continue walking, either until its fatigued collapse, or perhaps the moment when it shucks its cocoon to reveal a newly free monumental woman. Considerations of female strength are also present in Composition with a Torso and Child’s Hands (1986), in which a pink plastic torso is sliced diagonally, again revealing fibrous innards, but this time it is fitted with a sturdy wooden frame where an arm should be, and bound to it is a clinging mass of textile shapes. Alina Szapocznikow, Tumours Personified, 1971. Polyester resin, glass wool, newspapers and gauze. Courtesy Zachęta – National Gallery of Art, Warsaw and Kumu Art Museum. Off from the other side of the main room, a wide corridor splits into three. In each section is a sculpture made up of varying repetitions of the same object, on a bed of material on a raised platform. On the first is Põder’s Clodhopper, Stride of a Man of the 20th Century (1999), empty shoes made from fat, soap and leather on a bed of dirt. On the second, atop a sheet of shiny metal, is Põder’s Tongues (1998). These are human tongues, cut and exaggerated in size, made from soap and water and in various stages of discolouration and corrosion. Their repetition could be taken as the silences of one woman holding her tongue, or, if lifted from an attachment to a single body, they present a threat: an army of previously held tongues. On the third is Alina Szapocznikow’s Tumors Personified (1971), strewn across a layer of grey gravel. Produced in the final years of her life, after Szapocznikow had been diagnosed with cancer, into each of the enlarged, gnarled tumorous forms her face is moulded. Some struggle outwards, some seem to be in a state of sleep, while other sink back into themselves in a stricken acceptance. They expound the painful desire to express the multifarious minutiae of trauma and its daily emergences, in kinship with Põder’s oeuvre. In the next darkly-lit large room, Ursula Mayer’s installation But We Loved Her (2014) creates its own semiotics. Objects such as newspapers with Margaret Thatcher on the front page and the Euripides Trilogy interweave with glass sculptures, providing surrounds for the films Gonda (2012) and Medea (2013). A series of glass and wax sculptures speak to the push and pull relation of Szapocznikow’s work, as well as the motif of the cast mouth in Szapocznikow’s wider practice. The wax births brightly-coloured glass stems, which at their end have a moulded pair of lips – futuristic speaking things that roll the sign of female around inside their mouths. Ana Mendieta, Moffitt Building Piece, 1973. Super-8mm film transferred to HD digital media, colour, silent, 3’17” min. Courtesy The Estate of Ana Mendieta Collection LLC and Galerie Lelong, New York and Kumu Art Museum. 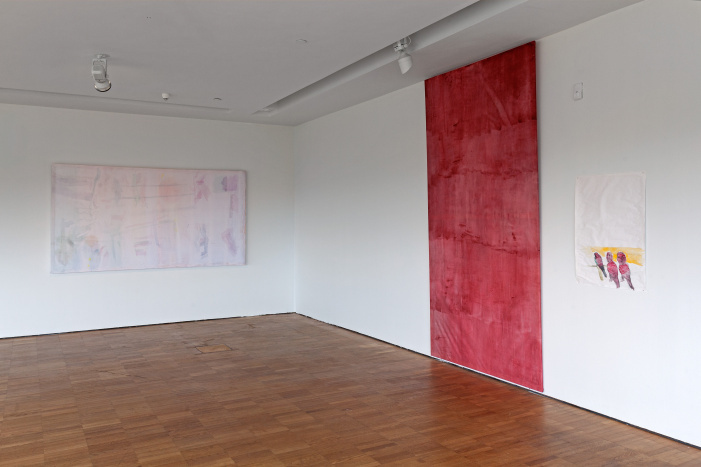 In the room containing Ana Mendieta’s works, the ghostly imprints of Mendieta’s body in the natural environment in Silueta Works in Mexico (1973–77) act in dialogue with Põder’s Tested Profit. Rubber Bags (1999), four body-bag like sculptures sliced in different patterns. These works appear as negatives of one another: Ana makes prints in the earth – missing women’s bodies – Anu makes portable prisons – one of the bags is sliced from head to toe as though the female body has fled. 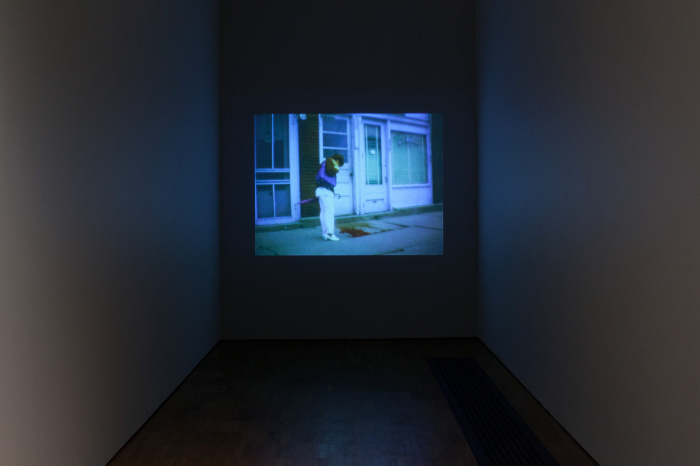 In Mendieta’s Moffitt Building Piece (1973), a stream of blood runs from under a storefront door onto the pavement, while Mendieta films the mixed reactions of the passers-by which range between disgust, momentary interest and complete disregard. This stream of blood echoes the gush of textile along the floor that emits from Põder’s seething shrunken woman in Long Bag. The two works ask a similar question, twisting between dejection and threat: for how long will you be able to ignore me? I eat sky, I excrete sky. a question in answer to a question. Koskaru’s works consider the different effects that regimes and war have on the everyday lives of women and men; both directly and in the knowledge that war is occurring elsewhere in the world. Large canvases swim with coloured stains, pencil drawings of sculptural, mythological women and animals rising and swelling from underneath. Again, this series has its own internal language, vast washed planes that have their own order. A vertical red plane the height of the room engulfs the bodies of those who stand in front of it. Interplays between personal and shared violence run throughout the exhibition, and this work resonates with the blood-red smears in Mendieta’s works and the red liquid suspended in a heart shaped glass pendant in Mayer’s installation. Installation view, Katrin Koskaru, I Eat Sky, I Excrete Sky…, 2017. Courtesy the artist and Kumu Art Museum. Põder is little known outside Estonia, and has only occasionally been exhibited in wider Europe. Through her expressions of the often-unnoticed moments in female/feminine labour and life, Põder’s works offer ‘the buzz of solidarity’.7 Põldsam writes that the world of emotions presented by Põder ‘confirms the Soviet Estonian attitude towards intimacy as something taboo, something that wasn’t discussed and probably not thought about on a large scale’.8 Through her sculptures – of which she made around one per year9 – a female experience of Soviet and post-Soviet Estonia can be mapped, with Põder at once adding to and evading these dominant narratives. In her 1979 text ‘Vivre l’orange’ (‘To Live the Orange’), Hélène Cixous speaks about the writings of Clarice Lispector, who she considered the purest example of écriture féminine (feminine writing). Lispector had an effervescent impact on Cixous from across time and place: ‘From far away, from outside of my history, a voice came to collect the last tear. To save the orange. She put the word in my ear.’10 This is an effect that Põder’s sculptures also have, a call beyond their context. 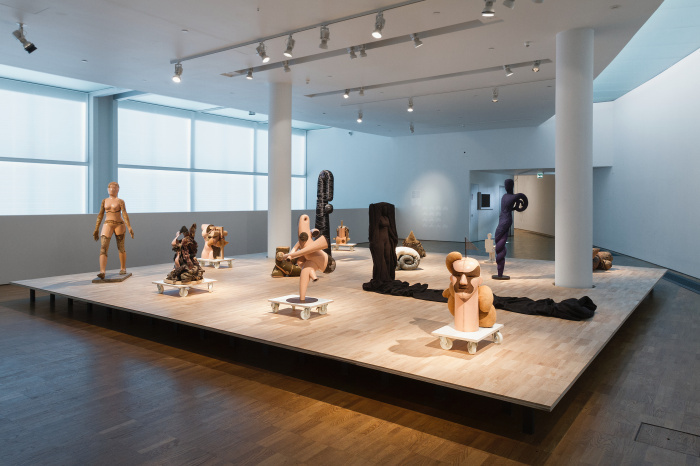 This exhibition brings into focus the ‘feminine language’ of sculpture – a decades-long and still-evolving tactile dialect of strong and soft and spiked.